PDAM Surya Sembada Surabaya - PDAM Surabaya is a reputable regional government-owned company in Indonesia, running business in water management and distribution. PDAM Surabaya is based in the capital city of East Java Province, Surabaya and has its business activities in the distribution of clean water for the general public in Surabaya, Pasuruan, Sidoarjo and Gresik. 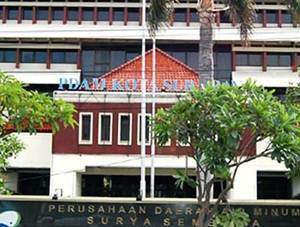 PDAM Surabaya was established in 1976 and if fully owned by the City Government of Surabaya. According to information found in PDAM Surabaya's website as cited by JobsCDC.com, PDAM Surabaya has 547,819 water subscribers as at the end of 2016. Its subscribers include 502,124 residential subscribers, 1,239 government subscribers, 38,089 commercial subscribers, 404 industrial subscribers, 3,794 general social subscribers, 2,163 special social subscribers, and 6 port subscribers. D3 degree in any field. Skilled in Structure Query Language (SQL). Have good skills in android studio programming language, preferably react native. Technical experience in developing application (write in your CV). JobsCDC.com now available on android device. Download now on Google Play here. Please be aware of recruitment fraud. The entire stage of this selection process is free of charge. PDAM Surya Sembada Surabaya - TSI Staff PDAM Surabaya January 2109 will never ask for fees or upfront payments for any purposes during the recruitment process such as transportation and accommodation.